In the past few Bithereum blogs we have discussed what the platform is, the basics of how it works, our redemption process, and the issues plaguing Bitcoin (BTC). 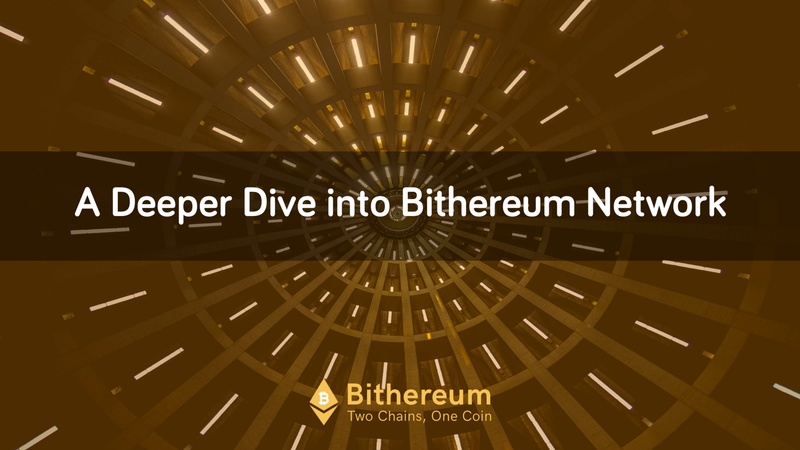 But now, we will dive deeper into the solution we are providing and why Bithereum Network is a game changer for the entire crypto industry. To combat the issues of the current Proof of Work (PoW) model used to mine Bitcoin, Bithereum will implement a Proof of Stake (PoS) model based on Ethereum’s Casper protocol. PoS is not a new idea as it has been discussed among forums and crypto circles as early as 2011, but it’s implementation has not yet been fully introduced. At its core, PoS is a consensus algorithm where the creator of a new block is selected based on the amount of currency they have staked. The validation process known as Proof of Work was applied to Bitcoin during its inception in 2008 and is a requirement that mining be performed in order to verify groups of trustless transactions on the blockchain. The major problem with this is the exorbitant electricity costs and high computing power hardware needed in order to profit. On the flip side there is Proof of Stake, first introduced by Peercoin in 2012, as a solution to these issues. PoS is defined as a form of proof of ownership of the currency. In other words, PoW mining a block depends on the work done by the miner, while with PoS, the importance is held on the amount of coins a miner holds. This means block creation isn’t dependent on miners racing to solve the complex cryptographic puzzle, which burns a massive amount of energy. They instead are selected in a random, nondeterministic way based on how much currency they have staked. These miners are known as validators and have the opportunity to vote on the creation of new blocks while being rewarded in proportion to how much they have staked. Since PoS doesn’t require expensive mining hardware, energy consumption is dramatically reduced. Miners won’t be racing to create each block, so the energy will only be consumed by the validators who are selected. Under the current PoW model, you can be burning energy all day and night to mine but never receive a reward if your machine becomes obsolete or you aren’t in a mining pool. With PoS, miners don’t need to upgrade to more expensive machines to compete, they can simply reinvest the rewards for further staking or use the money they have saved or earned on processors that will increase transaction speed. In PoS, your influence on the network is dependent on how much you have staked, so in order for an individual or an entity to control the network, they would need to have at least 51% of all staked coins. Currently, the Bitcoin wallet with the most coins has approximately 189,837 BTC, which is less than 1% of the max supply. The probability of someone or entity or cartel to obtain 51% of all coins is infinitesimal. Although possible, it’s exponentially more expensive than obtaining 51% hashpower in PoW, thus increasing network security and reducing the risk of centralization. Another major benefit of PoS is lower equilibrium transaction fees. With PoW, transaction fees are based on the miner’s electricity costs, mining equipment depreciation, mining labor, and a market rate of return on mining capital. With this model, miners will elect to add transactions to blocks that have fees where they profit. Unfortunately, the more miners in the fray, the higher the difficulty, the more hashpower required, thus the more electricity burned. With PoS, transaction fees will only be needed to compensate labor involved in maintaining bandwidth and storage space, in turn, the fees will be exceptionally low. This will yield especially beneficial to the Tragedy of Commons problem the current PoW model will face, since validators won’t be disincentivized to participate due to the negligible costs required. There is however a caveat in PoS that Ethereum addresses with their Casper protocol and its slashing conditions. In most PoS models, there are only rewards for validators creating new blocks, without any penalties. This creates the “nothing at stake” problem. This problem essentially means that while validating blocks, there might be multiple competing blocks and instead of choosing one, the validator will decide to approve all of them just to be sure. This can cause a chain reaction of multiple forks stemming off the main chain, making it hard to determine what the real chain is. Enter slashing conditions, which are created to ensure that validators act in line with protocol or else their stake will be “slashed” and they lose their staked coins. Since no one wants to lose their staked coins, they will act in line with the protocol and be forced to only vote the block they think is accurate. With slashing conditions, this PoS model follows Nash equilibrium principles since based on all possible outcomes, the optimal decision is to behave benevolently. All in all, Proof of Stake is a transaction validation method that will make the network faster, more efficient, cheaper to run, and more secure. It eliminates the need for expensive hardware, helps to mitigate high energy costs, and prevents both ASICs/large pools from dominating and increasing the network security from 51% of attacks. By implementing this into Bithereum, the benefits of this technology will positively affect Bitcoin’s issues and help to ensure its long term success. The process of PoS will take time to implement but work is underway for completion. Bithereum Network however will begin mining prior to its completion through a Proof of Work algorithm known as Equihash, a memory-hard algorithm that can be solved efficiently though GPUs rather than ASICs. This means that general home computers with a surplus of memory are far more suited for the task than specialized hardware chips. 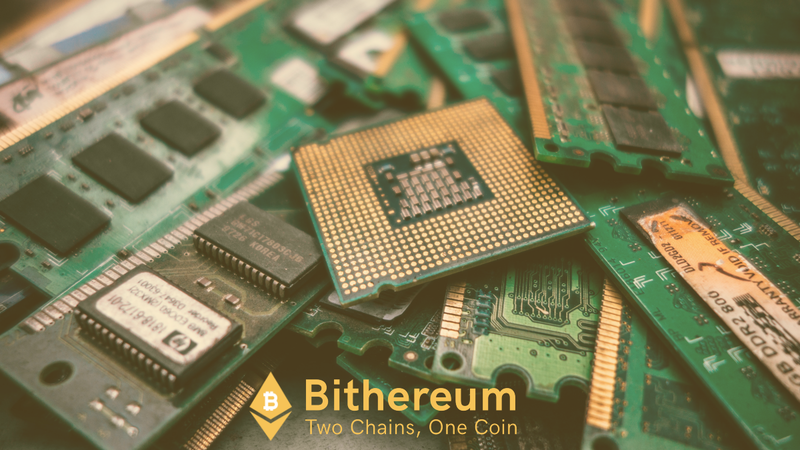 This method of mining places Bithereum in an optimal position to shift into PoS while still benefiting its early miners with additional coins to stake once the model is fully implemented. Though Equihash is the name of the algorithm, there are several ways this algorithm could be tweaked depending on two parameters in the code, ​N​ and​ K​. These parameters directly affect the time it takes different combinations of processing power and memory, as well as how memory-intensive finding the solution is. Typically, ​N​=200 and ​K​=9, but it turns out that these numbers aren’t effective in terms of either resisting ASICs or the mining cartel, as has been displayed through all of the 51% attacks on Equihash coins. The primary reason for this has to do with memory hardness; the optimal amount of memory for the 200,9 parameters is a window of 50MB to 144MB. The issue is that the Antminer z9 has the ability to mine this effectively, rendering its purpose of being ASIC-resistant as obsolete. However, when the parameters are adjusted to ​N​=144 and ​K​=5, the optimal amount of memory needed is window between 700MB to 2.5GB, making it far more costly to build an ASIC to combat this, as it is 17x more memory intensive. Furthermore, having a relatively unique algorithm is effective in combating 51% attacks for the short to intermediate-term because it places the coins into a new pool of power. Though Bithereum will be starting off with Equihash <144,5>, the main goal is to implement a hybrid Proof of Stake into the chain as soon as possible, as it is clear that ASICs cannot be stopped forever no matter how many times the hash algorithm is adjusted. Once all the developments for PoS are complete, the model will be implemented into BTH and mining will shift out of Equihash. All miners who had been performing GPU mining will then immediately have the ability to stake the BTH coins they have mined thus far. This would give them a further advantage over regular BTH holders, as they would have more to stake. 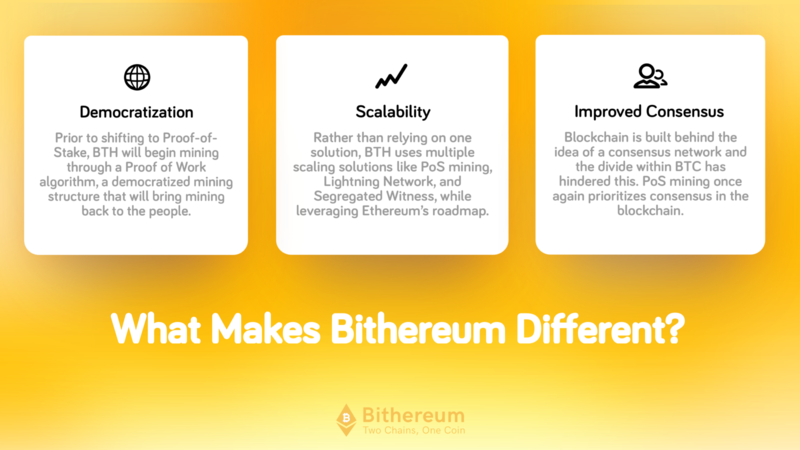 While the Bitcoin scaling debate has pit the community into opposing sides, side-chain scaling vs. on-chain scaling, Bithereum recognizes the value of both options, and will implement all-encompassing scaling solutions in addition to Proof-of-Stake. Specifically, BTH will use a Lightning Network, which is a system designed to increase transaction speeds by moving these transactions off the chain and into channels, periodically reporting back to the main chain. This process will facilitate large-scale data storing on each block, reducing transaction times and lowering costs. Lightning Network will work by using Bitcoin’s scripting language to create multi signature contracts, developed using Bitcoin’s various opcodes to simulate a payment channel between users. Another scaling solution BTH will utilize is SegWit. As more and more people get involved and use the network to initiate transactions, the more the networks get clogged up. Bitcoin is not equipped to handle these large volumes of transactions, but one way to help scale the network adequately would be to incorporate Segregated Witness (Segwit). Segregated Witness is a protocol that essentially breaks down each block into two parts. The original part contains the sender and receiver information, and the extended part contains all other data, including the hash and signature. This process allows for additional data and transactions to be stored in each block. BTH will incorporate this protocol into their process, allowing for both on-chain and off-chain solutions. Visit the Bithereum Network website to learn more. Stay-up-to date with our project news and announcements by following our social media channels: Facebook, Twitter, and LinkedIn. Join the conversation on our community channels: Telegram, and Reddit. Also, feel free to check out our blog on redemption if you are an Ethereum or Bitcoin holder as both chains can be redeemed for Bithereum! Bithereum is a hard fork of the Bitcoin blockchain in combination with Ethereum's technological roadmap structured around Proof of Stake.